These are common injuries. Recently US Medicare data noted that the most common musculoskeletal presentation to a doctor is shoulder pain. We see rotator cuff injuries in 20 year olds to 90 year olds. Young patients are more inclined to acute high-energy injuries but can still fall victim to attritional disorders from repetitive or overuse. For example elite swimmers. The peak incidence is in the 40-65 year old group, and especially prevalent in manual workers doing repetitive, mostly heavy work and frequently using there arms in an overhead position. Attritional disorders include rotator cuff tears, bicipital tendinopathy , Acromiclavicular arthritis and impingement. 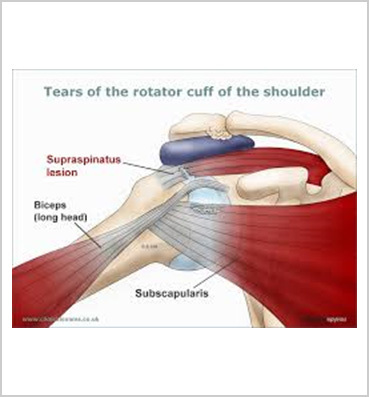 It is common for shoulder injuries to be work or sport related, but as people age the incidence of tears naturally increases from wear and tear, so not every tear will be symptomatic. However, if there is little chance to rest an injury, it is far more likely to be symptomatic and chronic. This is very common in the work environment and can be related to inflexible work practices. Rotator cuff disorders frequently result in pain in the upper arm, rather than the shoulder joint region. As symptoms progress it is not unusual for pain to radiate up and down the arm. Neck stiffness and pain can occur because of spasm in muscles common to the shoulder and neck. If the shoulder is stiff the muscles around the shoulder blade do more work to compensate, and often people complain of more pain around the shoulder blade. The treatment for these disorders involves rest, anti-inflammatories, local linaments, physiotherapy and steroid injections. Some doctors have tried Platelet Rich Plasma and Stem Cell therapy, but these treatments are encouraging but unproven. Surgery is a last resort as the recovery is often quite lengthy. Prevention includes warming up before exercise or heavy work, carrying out a stretching program and avoiding extended use of the arms in an overhead or extended position. Alternating tasks every couple of hours in the workplace can avoid injuries from overuse.